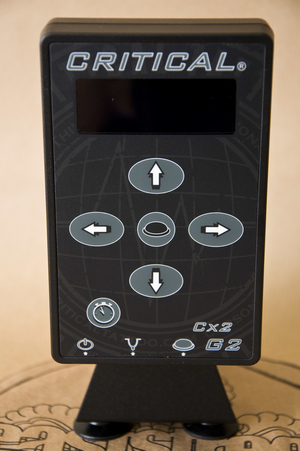 The CX-2 is the most advanced power supply ever developed for tattooing. Liner/ Shader presets now with 2 machine or 4 machine memory modes. All Critical power supplies are designed to be mounted to a work surface using our universal mount design (one supplied with each unit). Mounts are supplied with magnets and allow you to mount on top or either side of work surface. Magnets can be removed for screw mounting. If working from glass, suction cups can be added (SKU: 750695).